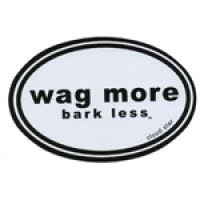 As I was driving to a winter hike last weekend, I saw a profound bumper sticker - "Wag More, Bark Less". Barking may yield short term gains, but wagging builds lasting relationships. When leaders bark, it diminishes them. All my lives - parent, husband, and CIO - benefit from wagging. As a father, there is the formal authority of parenthood. However, I rarely use formal authority and instead create a loving environment based on mutual respect and open communication. It worked with lions in Born Free and it works well in our household. In the office, outbursts of emotion may win the battle, but lose the war. Employees, customers, and bosses rapidly tire of emotional lability. A decade ago, a hospital CEO began swearing during a senior management meeting in an effort to demonstrate authority. Within a year he was gone. In my blogs over the past year, I've suggested that we're the Greatest Health IT generation, that these are the good old days, and that we're all suffering from stress acceleration. Despite the stress, the lack of sleep, the traffic, the cold, and the economy, we all need to keep our composure. I recently had a storage issue that could have escalating into a yelling match between my staff and the vendor staff. Instead of barking, I used it as a teachable moment to bring the teams closer together, strengthening the relationship, and enhancing the channels of communication. This effort to wag instead of bark laid a foundation for years of collaboration to come. As a parent, as a CIO, and as a human, I cannot think of any situation that is made better by barking than wagging. So next time, you're given the choice, remember the outcome of the bark verses the wag. A bark may be satisfying for the short term, but a wag is the sign of leadership, stability, and expertise for the long term. Great post. I am on my way to purchase that bumper sticker and give one to everyone in my department. It’s a great reminder to be thoughtful, respectful, calm and collected. Thanks for the great idea. You forgot sniffing. Sizing up a situation and the parties, before wagging or barking ensue, is paramount. We can all take a lesson from man's best friend. Before one barks or wags they must assess the situation using some good old fashioned sniffing...figuratively speaking. I really enjoy this post because I have seen leaders around me use "barking" to get results - I use "wagging" to not only get results, but maintain respect and long lasting relationships with everyone I surround myself with. Thanks for posting, this is good advice!